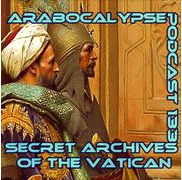 Secret Archives of the Vatican have been making their own distinctive brand of what they call Transglobal Breakbeat Dub Science for a few years now - drumstep, dubstep and glitchy electronica influences mixed with their trademark Eastern-inflected sound. They produce fine podcasts to shamelessly pimp their music by associating it with other people's excellent tunes. Sometimes they pretend to be DJs and produce mixes.